Automated runs help to execute the process automatically in the background and users can work on other processes in the foreground during the same time. Hence, this increases user’s productivity. However, the automated runs do consume the system resources and users must do their due diligence when scheduling the automated runs to maintain an optimal system performance. Adjust your confirmations to changes in the material master, such as a different replenishment lead time for a product. This blog provides a set of guidance for scheduling the Confirmation Update Run. It is recommended to schedule job for each run with the recurrence of not less than four hours. It is not recommended to create different job schedules for the same variant. However, in case the job must run at different times of a day, then this can be achieved by starting the job at the required time and by setting the frequency as once in 24 hours. Running it very frequently does not help if the supply situation is not changing at the same pace. We have observed that few tenants have heavy loads in the system because the runs are scheduled very frequently. This not only disturbs the same tenant, but also all other tenants in the system. During the creation of Confirmation Update Run, there is a Net Change Run indicator under selection Criteria. This indicator will be enabled by default. It is recommended not to disable this indicator as it helps in filtering the requirements for which there were no planning relevant changes in the system. In case you want to refresh the allocations, this flag can be set to false, but we recommend scheduling this variant with the option of “Start Immediately”, which would be an ad-hoc execution. If it is scheduled with a recurring frequency, we might have an impact on the performance of the system. Once the execution of a job is completed, an application log is generated. 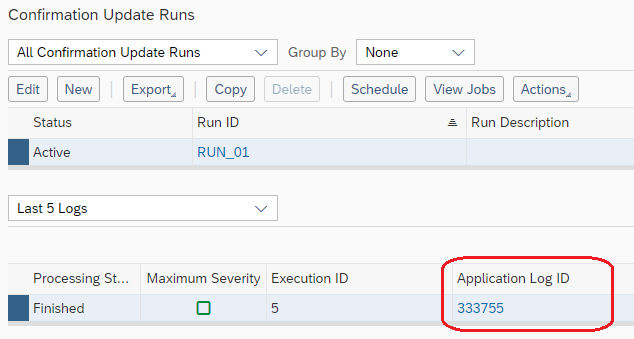 The overall execution time for a job can be calculated from the ‘Started On’ and ‘Changed On’ dates that are available under General section of application log. It is suggested to check the execution time on a frequent basis. If the execution time is on the higher side (say > 20 minutes), please check the number of open orders selected. If it is on the higher side, then it is recommended to see if the selection criteria could be altered, and new runs could be created with different selection criteria. Example: Splitting it by Product or Product Category or Planning Area. If the overall status is ‘Errors Occurred’, then the corresponding documents will be listed under the ‘Results’ section. It is suggested to check the error logs on a regular basis so that the inconsistencies in the documents could be corrected at the earliest. If the error is not resolved, then the orders are picked up again in the next run, but the allocation is not done. It is natural to create the same run or the same job frequency multiple times, unaware of the existing instances in the system. It is recommended to double check on the system if a job with the same frequency or a run with the same selection criteria exists before creating a new one. This blog may not cover all the points but will help to run your thoughts in the direction of careful selection of parameters and scheduling. Hence, It is recommended to the users of SAP Business ByDesign to adhere to the guidelines mentioned above.